One of my favourite hobbies is to analyze search trends of popular topics using Google Trends. Since we rely on Google so much for our informational needs, the search trends give a good indication of various issues pertaining to lifestyle, health, nutrition, shopping etc. Overall, as you can see, interest towards Keto diet is the highest, followed by Paleo and millets. Surprisingly, vegan and gluten free diet aren't as popular as compared to the other diets. 1. 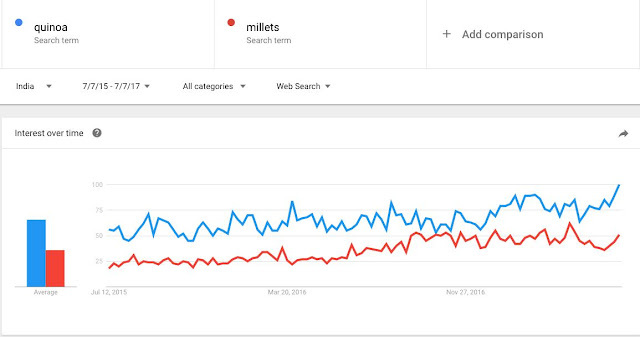 Interest towards millets started increasing sometime in the middle of 2016. Karnataka, Telengana and Tamilnadu are the top 3 states where people seem to be really interested in millets. It is not just the overall trend that irks me but the even distribution of quinoa related searches across the country. In the case of millets, except for the Southern States, there's hardly been any interest in the other regions of the country. If Punjab and Haryana wants to go gluten-free, then millets are the ideal alternative, not quinoa. I had earlier written about "Why Indians don't need quinoa?". If you haven't read it, please check it out. P.S. This analysis is a reflection of the search habits of Internet users in India (Internet penetration around 30%) and doesn't cover the entire population.